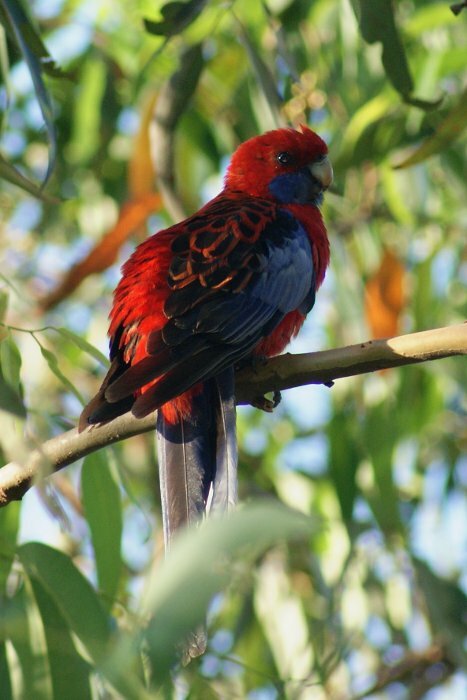 Crimson Rosellas are fairly common birds around Sydney's suburbs, usually in wooded areas, and can be found in greater numbers further out into farming areas. As with the other rosellas, they are in somewhat of a state of taxonomic flux, with different authorities recognising some as subspecies and others as full species. As such, the Yellow and Adelaide Rosellas are sometimes included as subspecies of the Crimson Rosella, despite different plumage and habitat. The plumage of the Crimson Rosella makes it easy to identify, but not necessarily easy to spot - as with many brightly-coloured parrots, they can be difficult to see in the dappled shadows of trees. They occur in this form in areas of Queensland and in a broad range of NSW and Victoria. 32-37 cm. 1: Hornsby Quarry, NSW, 24/12/2010.